Handmade Wedding Order of Service, Order of Ceremony or Order of the Day "Keen"
An essential for your wedding day, the ORDER OF SERVICE is needed during a church service to provide your guests with the order of the ceremony, the words for your hymns, any responses required from the congregation, and any other acknowledgments that you wish to make.An ORDER OF THE DAY or ORDER OF CEREMONY is equally important for a civil ceremony so that you guests are aware of the timings of the service, speeches, meals etc. The KEEN design is stylish and contemporary, featuring a beautiful glass tile hand painted with a silver daisy. The tile is mounted on pretty floral and pearlescent papers and an optional satin ribbon. 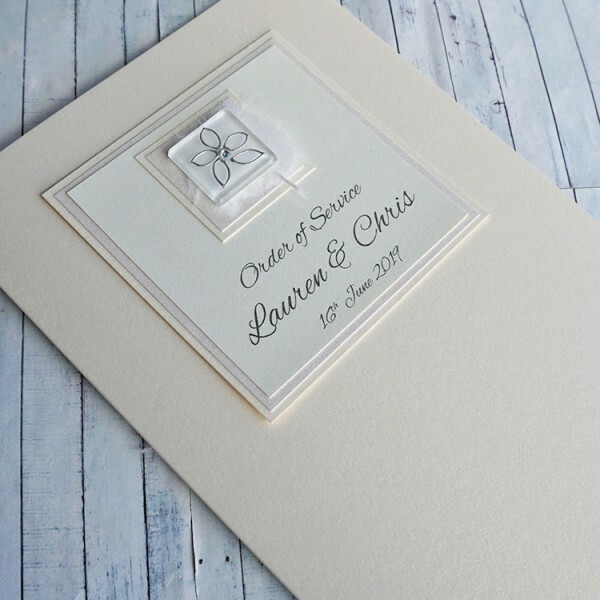 The design is created on your choice of superb quality white, ivory or cream textured card and supplied with matching textured inserts. The KEEN design is available in any colour scheme to match your wedding and we are happy to match to a colour sample. 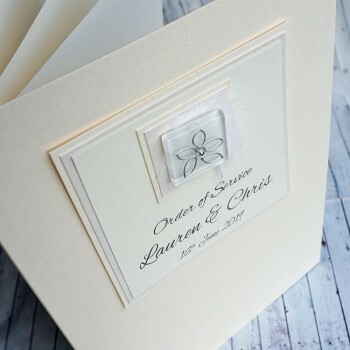 Handmade Flat or Evening Wedding Invitations "Keen" FLAT WEDDING INVITES can be used for day ..